The ETA, a Basque seperatist group, has adopted global guerrilla tactics. Last week they disrupted energy exports from France to Spain by bombing a high voltage power line. France is a major power exporter, and operates two 400 kV lines and two 220 kV lines that carry power into Spain. This week, the ETA placed two more bombs on these power lines. A warning to the authorities allowed them to find one device, they are still searching for the second (there is one conduit on each doast and one in the middle -- see diagram. The likely target is on the western coast.). In addition to the ETA, Nigerian guerrillas are moving towards global guerrilla tactics. Alhaji Dobuko, a warlord and muslim convert who admires Osama bin Laden, has directed his group (the Niger Delta People's Volunteer Force) to attack oil infrastructure (or oil industry personnel) in order to put pressure on the government. His threat is puts at risk 1-2.5 million plus barrels a day of oil and is largely responsible for driving the price of oil to recent record highs. Global guerrilla tactics are not restricted to Islamic groups or the Middle East. These tactics can be exported. The focus of these efforts: increase the financial costs of ownership (of the Basque region or the Niger river delta) until it cannot be sustained. Also: disrupt daily life for as many people as possible. “We are not bound by any circumstances, or to anybody, and we will continue to fight as is convenient and advantageous to us and by our rules.” Shamil Basayev, the author of the Beslan massacre (from a Chechen website). Global guerrillas are getting extremely adept at attacking systems. Iraq was hit with a multi-infrastructure cascade of failure on Tuesday. 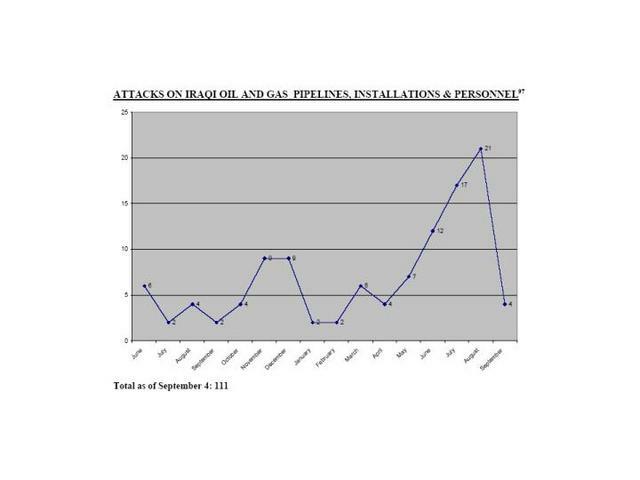 Saboteurs blew up oil pipelines at a juncture where they cross the Tigris River (co-location dependency -- See Infrastructure Meltdowns for more). This cut exports via Turkey. The pipelines also feed the nearby Beiji power plant (input and mutual dependency). 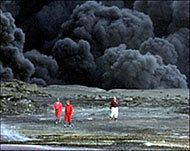 The oil flowed down onto the water and created a sea of flaming oil. The Beiji plant was immediately shut down due to fears of fire spreading to the plant (update, it is claimed an adjacent cable shorted and shut down the powerplant). This rapid shutdown resulted in a wave of cascading electrical failures throughout the entire country (see Cascading System Failure for more). At one point the ALL of Iraq was without power. This attack demonstrates a qualitative improvement in system attacks, the quantitative improvement can be seen in the attached graphic from Brookings. Oil exports are a mere ~60% of stated goals (and still below pre-war levels). Total losses from oil system disruption now exceed $2 billion. Electricity production is likely (no good data is available, but anecdotal information is available) half of demand -- not nearly enough to support economic revival. Other resources: "Iraq: Electricity Disruption" "JOURNAL: More on Iraqi Electricity"
..top-secret CDs were stolen from the (oil) ministry last week in a highly professional and quick operation. They contain vital information about the country’s oil installations and locations of pipelines. They might attack the oil installations for double effect. Firstly it reduces international confidence in the Saudi regime and secondly it has a significant global impact. This fulfils bin Laden's ambitions of sabotaging the American economy. Furthermore it is possible that they could change their mind and start targeting regime figures... I think they will not attack before Bush is re-elected in November. Al-Qaeda is praying for a Bush victory, because Bush is facilitating the polarization between the Muslim and Western worlds and he is causing more and more Muslims to hate America. Let's put the horrible attack in Beslan in perspective. Like 9/11 and the Madrid bombings, it was a perfect example of classic terrorist tactics, unbounded by the traditional limits of state sponsorship. It serves to heighten passions. These passions can ignite aggressive military action (superpower baiting) or isolation. Both serve the needs of the guerrillas. Physical isolation. A rift between Russia and its allies in its rush towards unilateral action. An imperial presidency that doesn't heed critics. Mental isolation. The novelty of the attack undermines previous planning efforts. What should we defend? Who's the enemy? Chechens or al Qaeda? Confusion. Moral isolation. Justification for its bloody tactics in Chechnya -- a blind eye to linkage. "Our security trumps all other concerns." Highly connected nodes are a mix. Power engineering principles correctly suggest that the majority of highly connected nodes will be power plants (see "Design Flaws: Methods of Attacking Critical Infrastructure" for more). However, contrary to expectations, a small number of transmission substation nodes serve are also highly connected -- 50 have a degree higher than 10. 1% of the transmission substations are high load nodes. These high load substations are nodes with high betweeness (a high load of shortest paths between nodes on the network). These substations aren't necessarily highly connected nodes and some are merely high load throughput for long-haul connectivity (a critical part of the US power grid since 50% of the electricity generated is allocated via the wholesale market, much of it over long distances due to NIMBY restrictions on local power production). High load nodes are best termed the "hubs" of the network. 900 of the distribution substations can potentially become isolated clusters (41% of the total). This means that these substations are only lightly connected to the grid. If the transmission substation that connects them is taken off-line via an attack, they are disconnected from power generation and go dark. Attacks on power substations and their direct connectivity will have little impact. The high degree of redundancy at the power substation level prevents major system failure. This is in stark contrast to the simple, production limited system in Iraq (see "Iraq: Electricity Disruption" for more) where the removal of a power plant from the grid will have a major impact. A big caveat on this "finding" is: this analysis doesn't account for "base power" generation from large producers (hydro-electric and nuclear). Power production isn't homogeneous. The elimination of these large systems from the grid would result in major disruption. Attacks on transmission substations yields the greatest system impact. In general, the removal of high load substations is more important than highly connected substations. A loss of only 4% of the highest load transmission hubs disconnects 60% of the grid from power. Cascading failures can amplify the impact of high-load node removal. Cascading failure can shut down 60% of the grid with the removal of only 2% of the high-load nodes. If 1% are removed, 40% of the grid goes dark. I suspect that better analysis based on sorting the high-load nodes by the quality of their connections (based on voltage, with the high quality nodes as those with the largest number of high voltage connections) would radically reduce the number of failed nodes needed for a system-wide cascade. End Note: The implication is that an carefully prepared simultaneous attack against 10-20 substations of the right type could take 60% of the US end-users offline for an extended period (potentially weeks). If exploited by additional well planned attacks, this damage could be extended indefinitely. The solution to all of this type of vulnerability, isn't a complete rework of the grid. Instead, it's a resilient community. A community that produces most of what it needs locally.